On the 2nd, Catherine Bundock, John's daughter, notified me that he had died at home in Brighton (Sussex) on Sunday evening. I met John via letter and telephone in the early 1990s, when at the suggestion of Carl Weschcke, president of Llewellyn Publications, he contributed a chapter to my anthology Witchcraft and Shamanism, the third book in Llewellyn's Witchcraft Today series. We did not meet in person until 1999, after we had worked together on Sacred Mask, Sacred Dance, a book which is about 80 percent John and 20 percent mine, at most. I'll miss John's wry take on politics (Pagan and secular), Army life and life in general. A veteran of British campaigns of the 1950s in Malaysia and Suez, he retained a fascination for certain now-obsolete vehicles, such as the M2 halftrack, and I had just located a historic halftracks poster that I had been planning to send him as a gift. There is a room for him in the Castle. You can read John's chapter on Robert Cochrane, magister of the Clan of Tubal Cain, online.Sacred Mask, Sacred Dance is out of print but still available second-hand through such sources as Advanced Book Exchange. 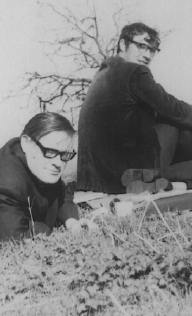 LEFT: John Jones, left, and Robert Cochrane, in about 1965. Dave and Ann Finnin of the Ancient Keltic Church contributed this recollection. On Sunday, Evan John Jones, author of Witchcraft: A Tradition Renewed and Masks of Tubal Cain exited this earth plane at the age of 67. While we were deeply saddened, we were not surprised. John had been suffering for the last ten-or-so years from emphysema and would wheeze while he puffed on the hand-rolled cigarettes he refused to give up. I suspect that he passed suddenly because the red-eared Hounds of Annwyn had to sneak up on him when he wasn't looking. They wouldn't have gotten him any other way. We first met John Jones in the summer of 1982. He was a short, stocky Welshman with a pugnacious square jaw and flaming red hair who lived with his wife and three children in a neat little house on the outskirts of Brighton. We had contacted him through a mutual friend with question regarding the writings of Roy Bowers (a/k/a Robert Cochrane). John had been in Roy's group during the1960s and for the next twenty years (plus three visits and countless letters and phone calls), he gave us enough information and insight so that we could continue to explore Roy's system on our own.There is no way we can adequately express our gratitude to the man who was our teacher and guide for over two decades. What he taught us was priceless and we will miss him.